$801, that’s what participants in a survey from the American Research Group estimated they would spend on Christmas presents last year (and in my experience, it’s really easy to go over what you plan on). Americans, in 2011, were also estimated to spend the second most in the world on Christmas presents with Luxembourg coming in with the highest number. For most families, presents are a huge part of Christmas celebration. Maybe you’d have unexpected expenses this year or your incomes been cut. Or perhaps you are wanting to simply lower the emphasis on presents this year. When you are on a tight budget, what can you do to stretch the money and make the most of it? Sit down and really brainstorm so you won’t have any unexpected surprises. Kids, spouse, your company party, extended family etc. Do you normally give a gift to your neighbor or babysitter? Write them down as well. Don’t worry about eliminating people from your list, yet, we’ll get to that later. 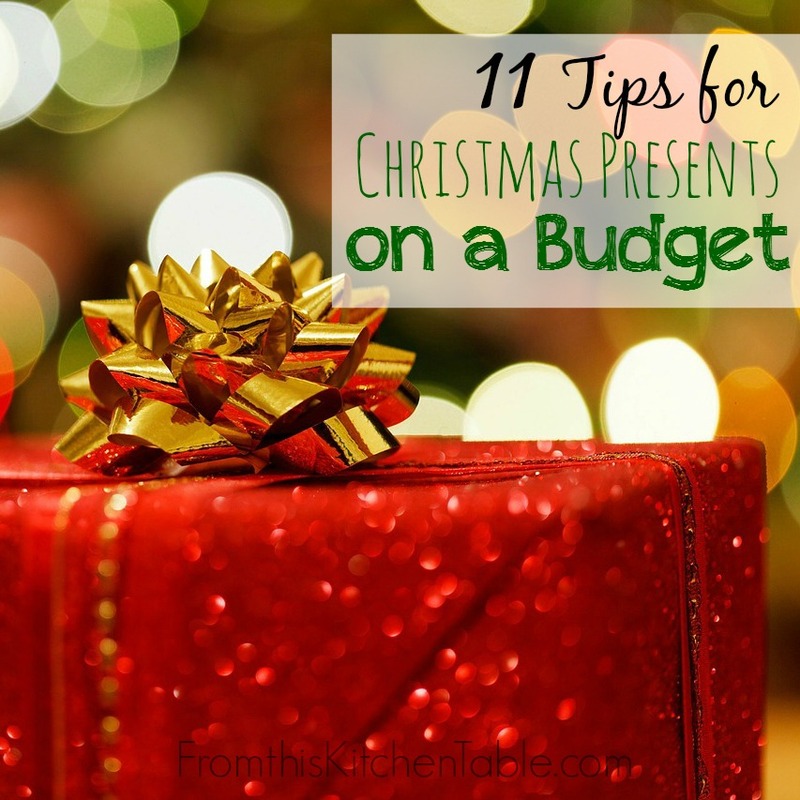 If you already have a budget, see what you have left in your gift category and then decide if you are putting any extra money towards presents for the holiday season (and how much if you are adding to it). If you don’t currently have a gift budget, look at the money you have coming in and see what you are able to allocate towards presents. Write down the amount of money you have to work with. Now that you have a dollar amount, look back over your list. If money is tight this year, you might have to cut down on the number of people you purchase for or be willing to get creative or make some more affordable presents this year. This is so easy to do! Even for me, and I’m not a big shopper. So, what do you do to keep this from happening? Take your list of whom to buy for and make a list of what you are going to buy for each person. STICK TO IT! So often, I’ll find just one more thing that would be perfect and the stash of presents keeps growing. Do you like to sew? Use those skills and fabric from your stash or that you buy 40% off and make your kids dress up clothes, a tent to drape over a table, cute aprons for the ladies on your list. Sewing not your thing but you are a whiz in the kitchen? Do some baking. Maybe spa and personal care items are more of your thing. Put together a gift basket of scrubs, lotions, and lip balms you made. There are countless options. Look on Pinterest and search on Swagbucks to find ideas. Okay, I know some people will hate this idea. I’m not saying to buy junk – be selective. I also know that in our home some portion of my kids’ gifts (3 1/2 and 18 months – I know this gets harder as they get older) are used every year! I’ve found books in great condition, like new puzzles, board games, clothes, and toys. Check garage sales and Facebook buy sell trade groups for your city. Do your research and know what a good price is. Before you purchase an item from Amazon , make sure it isn’t on sale at Target or Wal-Mart and likewise, before you purchase at a store, make sure there hasn’t been a price drop on Amazon . Also, check out Camel Camel Camel before you submit your Amazon order to see if you might get a lower price if you wait! No you aren’t going to be able to get everyone identical presents but if you can duplicate presents at all – maybe identical presents for all the co-workers and Christmas parties and like gifts for your baby-sitter, hair stylist etc. you can actually use up what you bought instead of having 4/5 of the bag of beeswax pellets sitting in our cabinet for years. Don’t wait for December to start thinking about presents. If you keep a running list of what you want to purchase for your family, you can be watching for great deals all year! It might be too late for this Christmas, but make your list for 2015 early and shop post-Christmas sales! This is an easy way to increase your Christmas shopping money a little bit. You earn points for doing web searches, streaming short videos, taking surveys and more. I don’t invest lots of time into it, but as I’m doing things on the computer I’ll have videos stream in the background and I’ll use their search engine. My goal is at least 35 Swagbucks a day. If I am able to accomplish that, I can purchase two $5 Amazon gift cards a month! It might not sound like a lot, but every bit adds up – $120 over the course of a year. 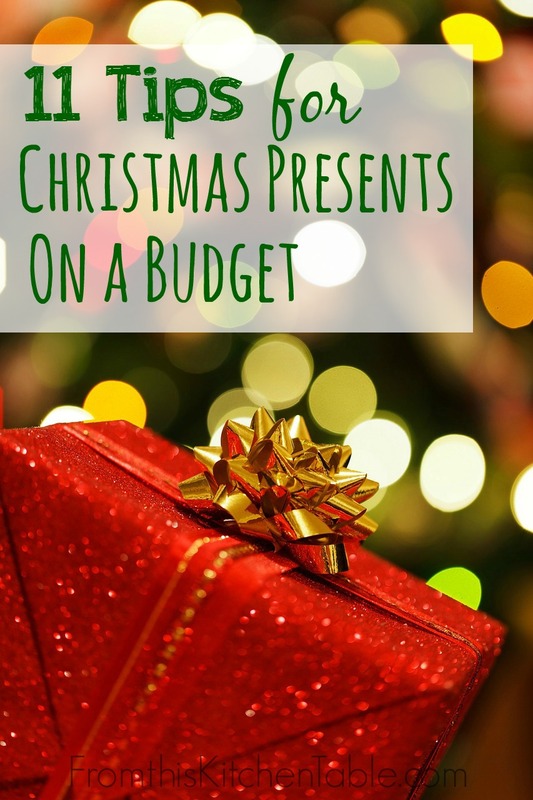 Just because your Christmas budget is smaller this year you don’t have to stress! It can still be a season filled with memories for your family. What tips do you have for Christmas presents on a budget? This entry was posted in Uncategorized on November 12, 2014 by Deanna Michaels. This is such a great post! I totally agree that having cash on hand tends to make my spending it a bit more cautinary…LOL Thanks so much for sharing these amazing tips! These are some great ideas. I’m running a Frugal Christmas & Debt Free New Year group and this would be perfect. BOTS Group. Thanks for stopping by and commenting, Sarah! BOTS is such a great group. Great tips…I lean to homemade gift the most. One tip I do is for our children we try to tick to one gift and stocking. They get things all year round so try not to go overboard at christmas;) Have a great Christmas! I love homemade gifts! We tend to do that for work party gifts and extended family. One gift and the stocking is a great idea. So true, why go crazy at Christmas. . . they really enjoy the things they get randomly because it’s only one thing instead of competing for attention with piles of other presents. Great tips! I touch on some of these in a post scheduled for release tomorrow. We do not buy for anyone other than kids in our family. It is just SO much easier and keeps Christmas more simple. Pinning:) Stopped over from the BOTS group! That would make it so much easier and eliminate a ton of stress. Hooray for simple Christmases. Thanks for pinning and commenting. Thanks for these great ideas Deanna. I have 4 kids and an overly generous heart. These are great ideas! I was thinking about taking out cash but I always find better deals online and then I’m not tempted with so many other things at the store. True. I always shop around before buying and a lot of times I can find better deals online. If I do it that way, I transfer the money to another envelope to put back in the bank. I love Amazon, but we don’t have Prime and it seems a lot of time what I want is under $30 and then I’m hunting down stuff to make up the difference. 🙂 You could also take out a small portion of your gift budget in cash to have for in store purchases and do the rest in the bank. Every so often, you can try Prime for free. I’m in a 30 day trial right now, I just have to cancel before the 30 days is up. Reevaluating your list is a really good idea – I think some times we buy gifts for people because we feel we need to, but I always think if you don’t spend enough time with that person to really know what they would love to receive you should just send a card instead. Thanks, Clare! I think that’s true. Just like the rest of life we do things because we think we should. I love thoughtfully written cards – what a great idea if you don’t know the perfect gift. Great ideas. I love Christmas and giving gifts, but this year, we had to set a budget. Between having a Freshman in college, a sister getting married, and having to put a roof on the house, fall hit us hard. Now that I set a budget in my head, I am not stressed at all about shopping. Hopefully, people will take your tips to heart and make this a happy holiday season and not a stressful one. Thanks! Yes, some years are harder than others. You do have some big expenses there! Budgets can be so freeing. Thank you much for your comment. Thanks for sharing with us at Simple Lives Thursday; hope to see you again this week. It’s hard to keep the cost of christmas down, these are really great tips to help! Thanks, Stella! It is very hard to keep from spending more than we want. Pingback: The Holiday Blues: Family Fun Friday features and linky! Thanks! Budgeting really does help keep spending under control. 🙂 Thanks for the feature. I am drastically reducing the people I buy for this year. It will save sooo much money. Visiting from the Frugal Friday Link up.